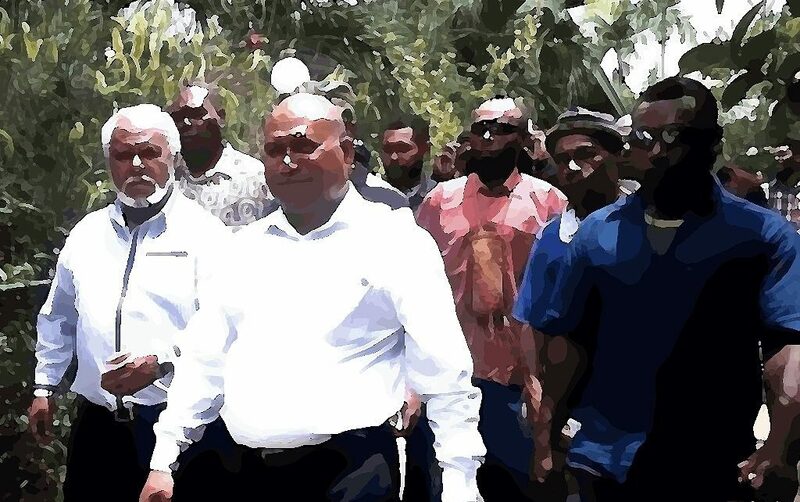 This is Part II in our five-part series on Madang Governor, Peter Yama. See Part I here. In late 1999 the National Capital District Commission (NCDC) – a body created to govern the nation’s capital – found itself in the limelight for all the wrong reasons. The Commission, and the NCDC Governor were suspended by the national government following a ‘Ministerial Committee of Inquiry dealing with corruption and mismanagement’. Jamie-Maxton Graham was appointed Acting City Manager. He commissioned a team of forensic specialists to ‘continue in-depth investigations based on the recommendations’ of the Ministerial Inquiry. Leading the subsequent probe was Carlyle de Silva. De Silva had served as Director of Prosecutions, and Director of Criminal Investigations at the RPNGC between 1980-1992. He was joined by Sisira Nanayakkara a Superintendent of Criminal Investigations in Sri Lanka, and forensic consultant George Pera. High on the list of questionable contracts was one involving Peter Yama and his security company Yama Security Services Limited (YSSL). 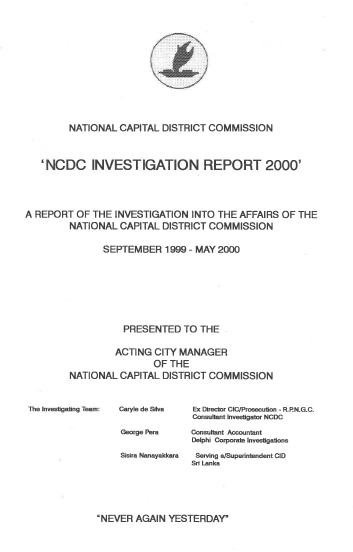 C. de Silva, G. Pera, S. Nanayakkara, ‘NCDC Investigation Report 2000, A report of the investigation into the affairs of the National Capital District Commission,’ September 1999 – May 2000. According to the investigative report, YSSL had obtained a multi-million kina security contract from the NCDC in February 1998. Allegedly the usual tender procedures were disregarded in breach of the Public Finances (Management) Act 1995. The investigation also found the contract was concluded in suspicious circumstances. Firstly, ‘the contract was rushed within a few hours at the instance of the Chairman, Yama Security Services, [Peter Yama], one time a Minister of State, by his manager and the OIC Administration’. It was then said to be hurriedly signed by the Governor, Philip Taku, and Peter Yama, late at night at the poolside of the Islander Travelodge hotel. The following day a Filipino employee was entrusted with K5,000 by the Managing Director, Yama Security, to be delivered to the then Deputy City Administrator (finance & Admin) [Frank Makanuey] as a reward for expediting and assistance in finalizing the Contract. This matter is being dealt with the Police and regarded as bribery. The contract was ‘tailored to meet the requirement of the Supplier’ and prepared by the Manager of Yama Security Services. ‘The NCDC legal section which monitors contracts was kept in the dark whilst it is obvious that the Contract had the tacit approval of Governor Taku’. ‘As for the period of contract, it is ridiculous to award a Security Contract for more than 12 months, which is open to renewal. In this case, the Contract has been awarded for 48 months’. Legal approval was eventually given by the NCDC legal section. However, it is claimed ‘a legal officer who gave an adverse opinion on the matter was suspended and dismissed’. It was not just the circumstances leading to the award of this security contract that invoked the investigation team’s ire, they were also highly critical of how it was implemented. Yama security Services earned the notorious reputation for crooked and dubious deals, not only with NCDC, but all their business contracts. A case in point was in June 1999, the company requested an upfront payment of K554,000 (approx.) to fund the purchase of security and accoutrements. This is unheard of in general business principles where the client is compelled to finance the Supplier upfront whereas the Supplier is expected to be equipped with such facilities before the tender is awarded. ‘The payment had neither Board approval nor did it conform with the Financial (Management) Act 1995’. The payment was not covered by the provisions of the security contract. The payment was processed and cleared ‘in haste’. The usual payment procedure was bypassed with the issue of a manual cheque which raised ‘cause for suspicion’. A ‘fraudulent claim’ of K237,600 was found for the overcharging of a rate of K7.50 for 80 guards on a 24-hour duty for 15 days instead of the contract rate of K2.80 ‘in truth and in fact, no such deployment was required nor supplied. This matter is now before the Police’ as ‘the facts lead us to believe that the purported emergency [deployment] was a total fabrication or farce by Yama Security acting in connivance with certain dishonest elements within the City hall’. Another serious discrepancy allegedly occurred with another invoice. Investigators claim that payment of security personnel was overcharged at K7.50 per guard per hour instead of the agreed K4.50 leading to an overpayment of K34,920. An extra vehicle hire claimed by YSSL for 3 months was not included in the agreement, thus the investigators claim ‘defrauding NCDC of a sum of K22,785’. In another claim, YSSL dispatched 3 dog handlers. The investigators allege this was done ‘fraudulently and without an explanatory note or covering approval (…) thus defrauding the hirer of K5,022’. Despite these explosive findings on the circumstances surrounding how NCDC and its Governor Phillip Taku hired Yama Security Services Limited, the cancellation of the contract and the question of whether YSSL was entitled to compensation would occupy the courts for the next 18 years. When NCDC cancelled its contract with YSSL, Peter Yama hit back. He claimed breach of contract, and a demanded K7,513,835.84 for the unperformed period. In December 2000 Yama obtained a default judgment on liability from Justice Kubulan Los, with damages to be assessed. NCDC and Yama duly entered into negotiations as to the extent of the compensation to be paid. Phillip Taku, the recently reinstated Governor of NCD, agreed to enter into a deed of settlement for K8.5m on 28 November 2001. Taku, however, then lost his position and was replaced by Bernard Kipit. Kipit refused to honour the agreement. This led to a resumption of the court proceedings, with Yama attempting to enforce the deed arguing that it had been endorsed through a Board resolution. NCDC on the other had maintained that the deed was not validly entered into as there was evidence to show ‘that no such resolution’ was ever passed by the Board, and ‘the resolution was a fraud’. Even if the resolution could be proven, the NCDC argued it was in breach of the Public Finance (Management) Act 1995, with no ministerial approval, amongst other issues. Additionally, the NCDC argued that there was no evidence to prove the facts of the claim on which the assessment of damages in the deed was based. Yama (far left) is a frequent visitor to the National Court house. At trial, the claims of the two parties were argued with untested affidavits, yet the judge, again Justice Kubulan Los, in his decision sided with Peter Yama. Justice Los found that NCDC had failed to ‘state clearly the extent of the dispute with the contract’. He also barred the NCDC from using a breach of the Public Finance (Management) Act 1995 as a defence. The NCDC promptly appealed this decision. While the appeal was pending, the NCDC decided to pay YSSL K2m as a part payment. The Supreme Court Appeal duly quashed the National court decision on the amount of compensation. The court found that Justice Los erred in many respects. The Supreme Court argued that the case should have gone to full trial as ‘substantive issues were handled in a rushed manner and pre-maturely determined’. There were also ‘a number of fundamental misconceptions and errors of procedure and law on the face of the judgment,’ the appeal judges said. This, however, was far from the end of the matter. Over more than a decade, the validity of the deed and the assessment of damages were part of a significant number of further court cases and appeals that culminated in a series of decisions during 2016 and 2017. In 2016, Justice Sakora – cited in Part I – again assessed the damages payable to YSSL and controversially decided to award K17,871,510, as the balance due for the unperformed contract period, plus interest. When formulating his decision, Sakora is alleged to have relied solely on Yama’s affidavits as proof and ignored the fact that some of the claimed losses were mitigated by YSSL ‘taking up and being paid in full for alternative work for the Commission after the date of the termination’. 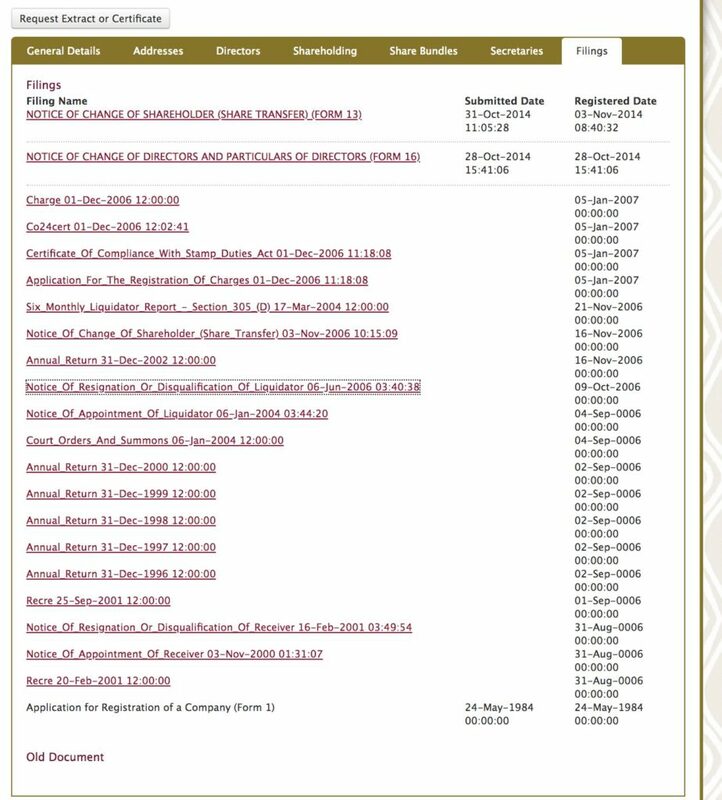 Sakora J also decided to ignore the invalidity of the Deed of Settlement, as determined by the Supreme Court in 2005 due to breaches of the PFMA 1995, describing the argument as ‘a beaten a tired weapon’. With respect to damages and interest, Justice Sakora also later unilaterally, and without hearing any argument from the parties, added a generous K5 million in legal costs to be paid by the NCDC. These decisions were quashed by the Supreme Court, despite Yama’s unsuccessful efforts to disqualify judges. Rather than K17 million the Supreme Court decided to award YSSL the nominal sum of K1. And rather than the NCDC paying K5 million to cover Yama’s legal costs, the Supreme Court determined that YSSL should pay the NCDC’s legal costs. This was a massive blow and a stunning defeat for Yama. Read more about the story of how Peter Yama lost K22M in a day. This brought an end to two decades of legal battles between Peter Yama and the NCDC. There are two final end notes though. In 2007, days after his retirement from the bench, Justice Kubulan Los, whose decisions marked the beginning of the whole YSSL / NCDC legal saga, decided to become a candidate for Peter Yama’s People’s Labour Party at the 2007 elections. Los unsuccessful contested the Madang Open seat. Meanwhile, in May 2018, it was revealed that the former National Capital District governor Phillip Taku, who was allegedly responsible for Yama’s original contract with NCDC signed poolside in 1998, is still waiting for the Sate to pay him about K10 million in damages over his removal as governor in 2002. It was reported Taku had won his case in both the National and Supreme Courts. Stay tuned for Part III of the Yama Files. Briefly,’ PNG Post Courier, 30 April 2007; ‘Madang counting slow,’ PNG Post Courier, 17 July 2007. T. Sii, ‘State still to pay Taku K10 million in Damages’, Post Courier May 4, 2018.